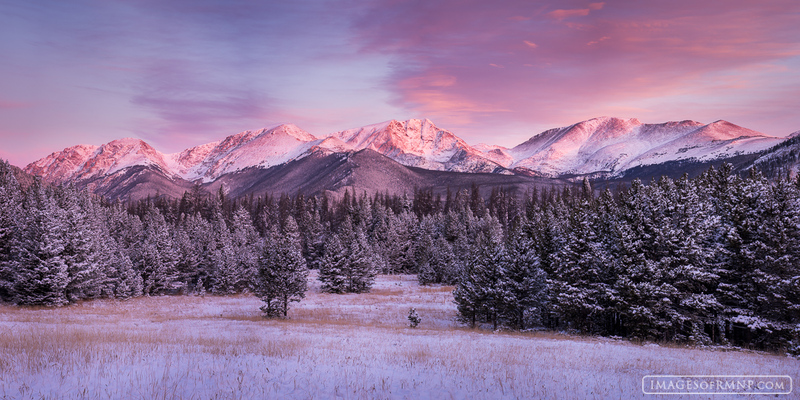 Pastel colors fill the sky above the Mummy Range on a cold winter morning. On this morning conditions were finally right to photograph a spot I found in April. I spent an hour standing around waiting for the light to get right and it was -11F. I realized about half way into that time that I didn't have the right boots on, so if anyone saw me they would have seen this strange man dancing by himself trying to keep feeling in his toes. It was definitely worth it though. Now, I just need to get into our crawl space and pull out the winter boots. This image was taken with the Nikon D810 and is a composite of 6 vertical photographs, meaning that I can print this at extremely large sizes. Photo © copyright by Erik Stensland.